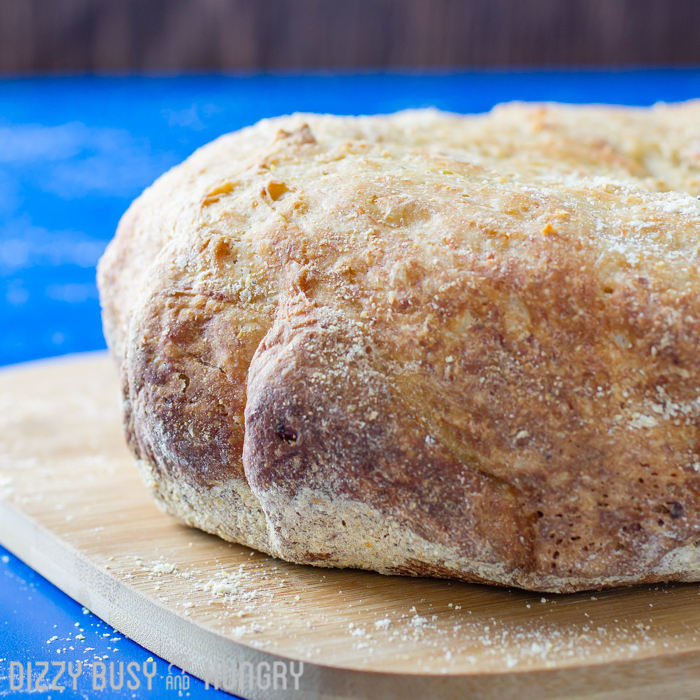 This Easy Crock Pot Garlic Parmesan Bread is crusty, flavorful, fresh, and best of all, EASY! Enjoy delicious, fresh-baked bread with just a few ingredients and no kneading! There’s nothing I like better than a thick slice of warm, fresh-baked bread, with a slightly melting pat of butter slathered all over it. YUM. Yes, I’m drooling a little bit right now! The problem is that I used to hardly ever get to enjoy homemade bread right out of the oven. I mean, who has the time? Or the energy? Even without having little kids around, I don’t find that I have enough spare time to really think about baking my own bread on a regular basis. That is, until I figured out how to use my slow cooker to bake bread. And, *BONUS*, these instructions require absolutely no kneading! This post may contain affiliate links. You can view our full disclosure here. Thanks for visiting! Crusty, flavorful, fresh, and best of all, EASY! 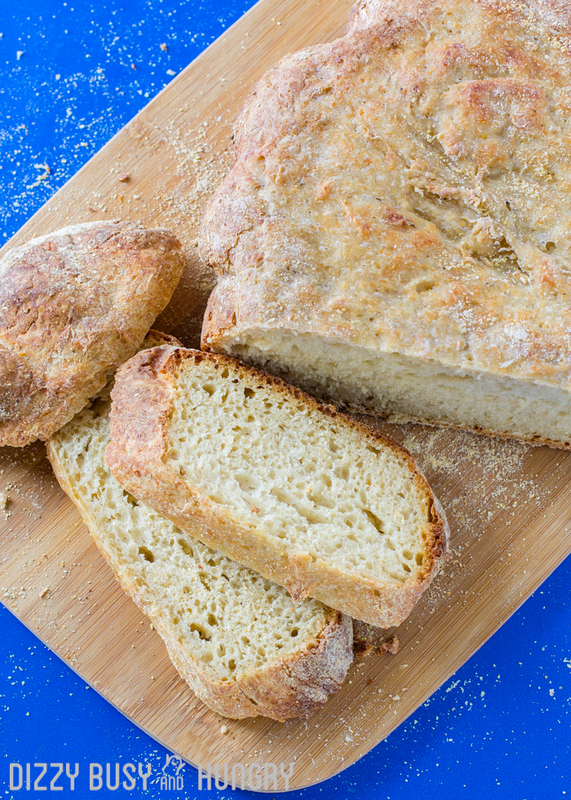 Enjoy delicious, fresh-baked bread with just a few ingredients and no kneading! In a large bowl, combine the flour, yeast, garlic salt, and Parmesan cheese. Measure the water, then add the minced garlic into the water. Cover the bowl with plastic wrap, and allow to sit for 1 and 1/2 hours. On a large piece of parchment paper, sprinkle the cornmeal (or flour), the dump the dough onto the paper. Form the dough into a round , sprinkle with some additional cornmeal, then cover with plastic wrap. Allow to sit for 1/2 hour. Preheat the slow cooker for about 5 minutes on high, then remove the plastic wrap, pick up the parchment paper with the dough on it, and place it in the slow cooker. Tuck or trim the edges of the parchment paper if necessary to fit under the lid. Place a layer of paper towels over the slow cooker, then place the lid on top of the towels. Cook on high for 2 hours, then remove from the slow cooker. If more of a brown crust is desired, bake at 400 degrees in the oven for 15-20 minutes (optional). Looking for some more great bread recipes? Check these out! Thank you, I had forgotten that you can make bread in a crock pot. I gave up on my bread machine a long time ago due to inconsistent results. I may try this. Wow, this threw me off when I saw the blog name and then your picture. Congratulations on starting the new blog! While I love your other blog, I really like your focus here too. Cooking for 2 is definitely different than cooking for a family. I have never done bread in the slow cooker but now I must try it. Luckily we are almost out of the loaf in the bread box and this will save me a trip to the store. Thank you so much, Audrey! I forgot how much work it is to start a blog, haha! I hope the bread turned out well for you, I have had lots of luck with this recipe. Thanks for stopping by! Saw this on Reader Tip Tuesday. I’m making this TODAY! Thanks for sharing – Pinned! I just made a loaf of bread in my crock pot yesterday. It was a big hit. Found you on Wonderful Wednesday Link Party. Pingback: Easy Crock Pot Garlic Parmesan Bread | Dizzy Busy and Hungry! Sounds awesome! I can’t believe you made it in a slow cooker! Pinned! Thank you for sharing on Merry Monday! Hope to see ya next week! Delicious! Thanks for sharing at the What’s for Dinner Party. Hope to see you again! Oh my goodness! 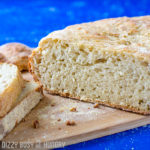 I’ve never thought of making bread in a slow cooker, but it looks incredible and super crusty – wow! Thanks for sharing at Fiesta Friday! This recipe sounds delicious with many flavors! I have never made bread in the crockpot before. I look forward to making bread in a crockpot! Your Garlic Parmesan Bread looks fantastic, we will love it! Thanks so much for sharing your post with us at Full Plate Thursday. Have a great week and come back soon! I have made a couple of bread recipes in my slow cooker and it really works. I use a foil collar and then a round on the bottom too to keep the bread from browning too much. Thanks for sharing with Fiesta Friday. It looks super yummy! Thanks for sharing with SYC. I’m sure it’s not intentional, but I’m not seeing a link back to the party.